A circular walk taking in How Stean Gorge - England's little Switzerland. The gorge has been described as resembling the Grand Canyon, but just on a much smaller scale! The walk then passes through Stan, Middlesmoor and Lofthouse, with part of the route being along the Nidderdale Way. 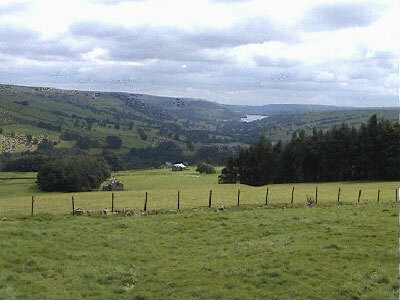 Many views along the way, especially towards Nidderdale and Gouthwaite reservoir. Parking: Follow sign to Stean from Lofthouse and the car park is on the left just after the road has crossed the stream (grid reference SE 097 733). Parking is also available at How Stean Gorge itself (SE 094 735) a few hundred yards further up the road on the right hand side, but a parking fee is payable. Leave the car park and turn left up the hill towards How Stean Gorge a few hundred yards ahead. The road can be followed straight on here, or turn right to visit How Stean Gorge itself, which is a very worthwhile detour. A fee is payable to walk around the gorge and visit the caves (hard hats and torches are provided!!). How Stean Gorge, known as England's little Switzerland is a haven of natural beauty and has been described as resembling the Grand Canyon but on a much smaller scale. During the last Ice Age, thousands of years ago, a glacier occupied the other half of Nidderdale. Torrents of water poured off the melting ice and cut deep into the rock. Over the centuries the force of the water has channelled deep into the limestone shaping and moulding the rock, and great hollows and cavities have formed making weird and wonderful shapes. The path can be followed up the inside of the wall by the road to view aspects of the Gorge, including How Stean Tunnel, before circling round to cross a bridge (viewpoint) over the gorge which leads a few yards later to the entrance of Tom Taylor's Cave (named after a highwayman). At Tom Taylor's cave you can experience the excitement of cave exploration without any of the normal dangers associated with caving. There is a walk through the cave with a little water underfoot and a few droplets from overhead. The cave is 530 feet in length with steps on either side. In the centre of the cave shine your torch overhead, as the cavern is said to resemble the stomach of a great whale. Upon leaving the cave you enter out into a field by the car parking area. Return back down over the bridge and pass back out onto the road. Follow the road up the hill for about one third of a mile towards the hamlet of Stean. About fifty yards short of a red telephone box, turn right following the public footpath sign for Middlesmoor. This is part of the Nidderdale Way. After about twenty yards go through another gap in the wall and follow the footpath between the wire fence on the right and the small wooded area leading down to a stream on the left. Follow the path down some man made steps, over the bridge and up the other side. Continue on up the steps on the far side and pass through a small wooden gate, before heading diagonally right across a field heading for a gap in the right hand wall about seventy five yards away, again following the brown Nidderdale Way footpath sign. Through the wall, turn left and continue to follow the Nidderdale way signs now heading up the hill, but keeping close in to the wall. After a few more yards go through another gap in the wall and continue on upwards. As the path begins to flatten, the church in the village of Middlesmoor comes in to view ahead. Follow the path on and pass through a gate before turning left on to the road heading up into the village. Pass the old chapel of Middlesmoor, which was an old Wesleyan chapel built in the 1890s, but now converted into a dwelling house. Continue along the road through the village past the pub and the post office. After the last of the buildings on the right, turn right down a broad grassy track, then immediately left through a wooden stile in the wall by two telegraph poles. Head along the grassy path past the wall on the corner of a car park, before passing through a small gap in the next wall heading for the left hand side of a small tree plantation. Go through two stiles close together by the edge of the plantation, before heading diagonally right across the field on a line heading towards a gap / stile in the wall slightly left of the house (Smithfield Hall) ahead. Through the stile, continue ahead keeping a fence on your left. Along this stretch there are beautiful views back along Nidderdale to Ramsgill and Gouthwaite Reservoir. Keep ahead through a gap in the wall, then through a further gap in the next wall across a field about seventy-five yards ahead. Continue ahead through yet another very narrow gap in the wall before passing out on to a farm track. Turn right on to the track, and follow it through the farm, before passing through two wooden gates about fifty yards apart. After a few minutes further walking trees appear on the left of the track which is How Gill Plantation. At the start of the trees, pass through a metal gate across the track and immediately turn right through a further metal gate, heading down in the direction of Limley Farm visible a third of a mile below. The path heads diagonally left down across the field heading for a gap in the trees. The path drops down quite steeply before crossing over a small stream and then through a gap in a wall by a large tree in the corner of the field. Once through the gap in the wall, head diagonally left towards a telegraph pole in the bottom corner of the filed. Go through another gap and continue on the same line for a further twenty yards before passing over a stile and into another field. Again continue on the same line towards the farm passing through a gap in the fence out on to the lane below. Go directly across the road and through a small narrow gap on the far side between concrete posts in the fence. Continue for about forty yards across a field and through a metal gate. Go across the yard and through a small gap in the wall before passing out on to a lane. Turn right on to the lane, on which after a further fifty yards there is a footpath sign for the Nidderdale Way. Pass through a gate and follow the track out in to the field where the footpath bends around to the left, picking up another Nidderdale Way footpath sign. The path continues along the right hand side of a fence heading down towards the River Nidd. Go over a wooden stile and follow a path, which initially follows the route of an often dry riverbed. Further down, the path crosses over the wire fence by way of a wooden stile. Continue ahead in the same direction on the other side of the fence, now only a few yards from the riverbed. Cross over the riverbed and continue along the path on the far side. After a further one hundred yards the path bends around to the left as it splits away from the riverbed. Follow the path around keeping next to the wall and through a wooden gate and continue ahead. The path turns in to Thorpe Lane and is followed for the next mile and a half, sometimes enclosed by walls on both sides, sometimes with only a wall on one side and other times not enclosed at all, until it meets a narrow metalled road. All the way down the Lane there are beautiful views of Nidderdale to both sides and ahead. Turn right on to the metalled road which enters Lofthouse and soon after passes the Methodist Chapel and the Post Office. Upon reaching the war memorial, where the road bends around to the left, turn right at the side of Fountain Cottage and follow the track past the cottages for about twenty yards, through a gate and continue along the stony path towards the river below. Pass over a bridge over the stream before coming out on to a road. Cross over the road, through a wooden kissing gate and continue ahead down the side of a fence following the large green public footpath to Middlesmoor sign, before keeping on the gravelled track through a gate in the corner of the field on to the road. Turn right around the bend then take the road off to the left signed How Stean Gorge. Follow this road for about one hundred yards before turning left back in to the car park.